The 2009 October Daring Bakers’ challenge was brought to us by Ami S. She chose macarons from Claudia Fleming’s The Last Course: The Desserts of Gramercy Tavern as the challenge recipe. Ami's blog is titled Baking without Fear, and I did indeed need some courage to tackle this month's challenge. This is only my third creation as a member of the Daring Kitchen and so far the last 2 recipes are helping me touch base with my roots. And yet again, I think my French father would have been impressed with these delicate, unmistakably Parisian cookies. 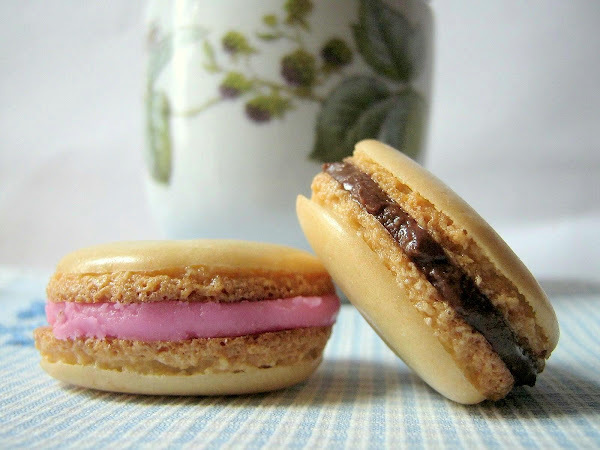 French macarons have been everywhere on blogs and sites like Foodgawker and TasteSpotting. On my too few and far between visits to France I see them in almost every patisserie. However, the few that I had tried never made me love them enough to want to try baking them on my own. Perhaps I didn't give them the chance they obviously deserved because now I am a true fan of the macaron. I feel terrible that I initially began this challenge half-heartedly. It seemed a bit daunting with the delicate egg white mixture which couldn't be over whipped or over mixed with the almond flour. And I didn't think I would be able to achieve the trademark 'feet' on my cookies. 2 hours and an amaretto sour later (I made these in the evening...late afternoon) my macarons finally took on the correct form! It was so exciting when I saw my first 'foot' forming on a cookie in the oven. The foot is that cobble stoned textured area of the cookie that holds onto the filling. It took several batches before mine produced feet. I found that I had to leave each piped out batch on the cookie sheets for about 40+minutes. I also had problems with my batter swimming around on the stubborn 'I don't want to lay down flat' parchment paper. This led to many, many deformed cookies. Sadly, a lot of them had their feet but were too misshapen for the camera. All the cookies tasted great enough to make me change my mind about macarons. The cookies themselves had a lovely almond flavour and they were light, chewy and airy thanks to the egg whites. I filled half of mine with a raspberry butter cream and for the other half I simply used a dark chocolate peanut butter. I've been in p.b. withdrawal. :) Both fillings were a perfect combination with the delicate almond cookie. There are endless possibilities on what you can use for a filling! The cookie batter can even be carefully altered with cocoa powder. So have fun with this recipe and don't be intimidated. The oven can smell fear. Fleming’s recipe calls for almond flour, but you can grind the nuts yourself if you are feeling ambitious or can’t get a hold of almond flour. (It is available at many online sources, however.) If you do grind the nuts yourself, be sure to add at least a cup of the powdered sugar with the nuts before grinding. This keeps them from turning into almond butter. Grind the nuts as fine as possible in your food processor. Maida Heatter suggests grinding nuts for at least 60 seconds, or longer than you think you need. They need to be extremely fine—powdery, in fact, like flour. If using almonds, try and hunt down blanched or skinned almonds. This helps with the texture and color. You might also consider toasting your nuts ahead of time and rubbing off the skins in some clean toweling. If you’d like to use a different nut besides almonds, you are welcome to substitute them. Hazelnuts or pecans are good substitutes, but feel free to experiment with others. Our own Helen, of Tartlette fame, suggests that if you do want to use a different nut other than almonds, to have half almond, half other nut, as almonds are drier than other nuts and help again with that all-important texture. If you have a nut allergy, you can make nutless meringue cookies sandwiched with a filling, but it would be great if you could attempt to obtain the size and shape of standard macaroons. Flavor variations are infinite. In Fleming’s original recipe, she calls for adding vanilla bean seeds to the granulated sugar, and folds in the zest of a lemon to make lemon macaroons. You can add cocoa powder, instant coffee or espresso powder, green tea powder, fruit zests. You can tint the batter (Helen again suggests using powdered food coloring to keep from adding too much moisture to the batter). The same goes for fillings—anything goes. Ganache, buttercream, jam, caramel, custard. An important note about coloring and flavoring: liquid food coloring can be used, but be cautious! Use 1-3 drops maximum, otherwise, according to Helen, it increases the moisture in the batter, and that can ruin the macaroons. She suggests one trick: mix the liquid color with the almonds and powdered sugar and to let that air dry for a couple of hours. This reduced the moisture a little bit. If you use more than 3 drops of food coloring, you’re going to have a disaster. That means using fruit puree is out. One way to flavor the macaroons is to use 1-2 teaspoons of citrus zest, 1-2 teaspoons of matcha (green tea powder), or 1-2 teaspoons of herbs or freeze-dried fruit powders. 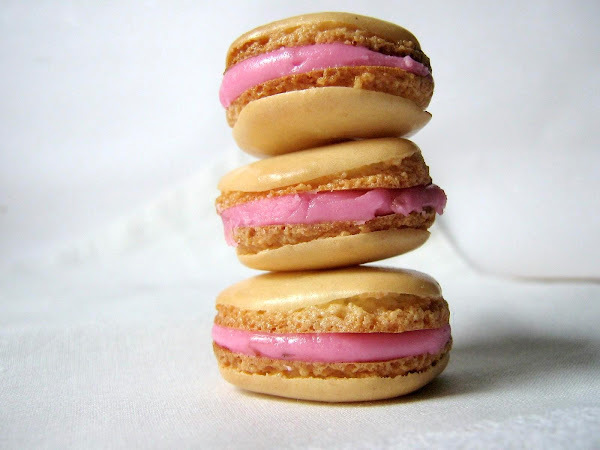 If you want savory macaroons, you can try 1 teaspoon of saffron or other savory dry flavorings. If you want to use powdered color, Helen says that up to 1 tablespoon is a safe amount. Bravissima ! You were super good at them ! Great effort they look smashing and the flavours sound delicious. Cheers from Audax in Australia. You did a great job! They look just splendid! It's my 3rd challenge as well, and I've yet to get the results completely right...everything always tastes great though...guess I'm just more of a cook than a baker! Love the way you described the "feet". Great job! 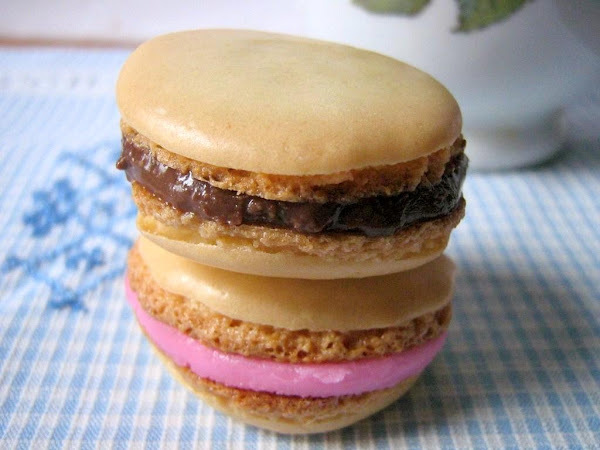 The trick is indeed to let the macarons "crouter" (= let them sit until the top sets) before you bake them. Otherwise they crack and you get no "foot" ! I do believe I like these!! Gorgeous macarons! I love the colours & flavours you chose =D. 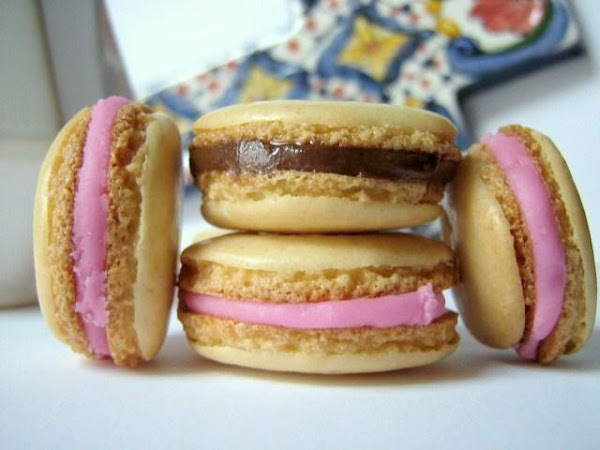 Fantastic macarons! They are adorable! Great job. They look great - nice job! 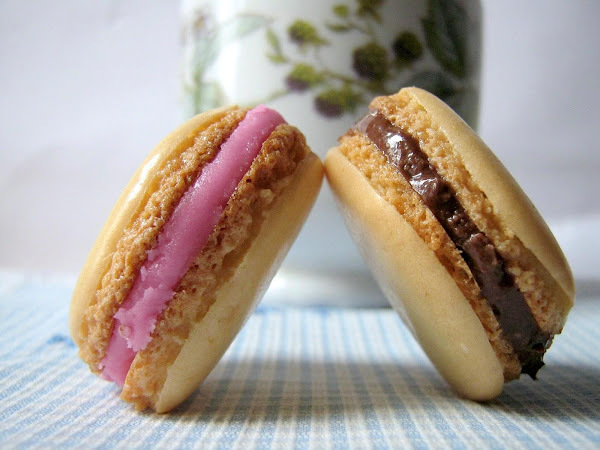 Your macarons look brilliant!! Well done! Your macarons are so delicate and exquisite. Oh dear, I have to try these for the first time this month and I'm sure the oven can already smell my fear...thanks for the egg white tip though, I'll be using that!